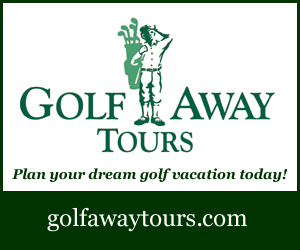 Most North American golfers have been influenced over the decades by magazine articles and golf buddy trips extolling the links courses and heathland courses of Scotland and Ireland, as if that’s all there is over there. But so often overlooked are the dozens upon dozens of great golf courses south of Scotland, and east of Ireland. 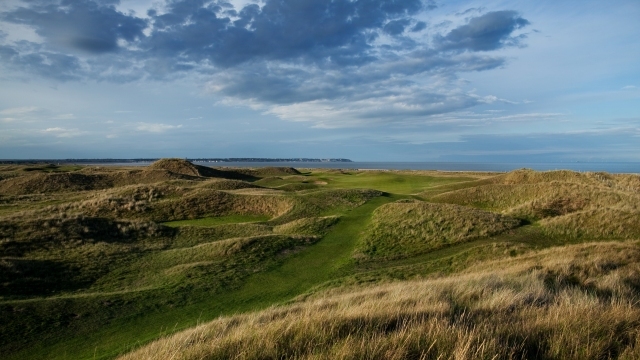 England and Wales offer a veritable cornucopia of outstanding golf options. And in particular, around London and the south and eastern counties of Berkshire, Surrey, Sussex and Kent. Having lived in London for a couple of years a few decades ago and having visited with golf clubs in tow in more recent years, I’ve been blessed to have played several courses in these counties. The Old Course at Sunningdale, an impeccable gem in lush, forested terrain not far from Heathrow Airport, remains my numero uno of all time. But I had never, until last week, had the pleasure of testing the links courses on the southeast coast. Here, along a roughly three mile stretch of beach and dune on the coast of Kent and flanking the ancient towns of Sandwich and Deal, are three outstanding layouts that will rival anything that Scotland or Ireland can throw at them. What a marvelous time I had! And if you can bear with me, I’d like to describe my marvelous time in two parts. First, I’ll natter on about my experience on the three “primary” (my word) courses I played. Then, when my editor decides to run the next instalment, I’ll chat about another more out-of-the-way diamond-in-the-rough that I visited, and on Kentish golf in general. Be warned, though, if you’re driving a rental car, no matter how small, many of the small lanes in these towns – and throughout Britain, for that matter – are arm-span wide only, and if you’re not used to right-hand drive, the left hand wall or hedge – or parked car — can be quite close. Also, if you’re not inclined to give way to the driver coming at you, you may not live to read another of my columns. I had the most gratifying opportunity to play the three courses here that date back as far as the late 1880’s, all built on the same marsh and dune-land right beside the water that merges the English Channel with the North Sea, and just north of the White Cliffs of Dover. On a clear day, you can easily see the coast of France, if not the baguette on the back of Gaston’s two-wheeler. The names of the three courses will be familiar to serious golfers. 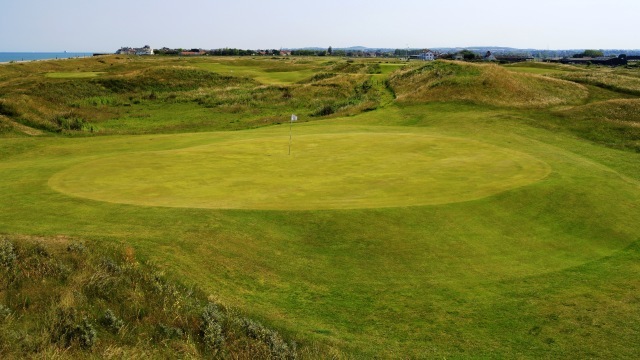 Two – Prince’s and Royal St. George’s — are side-by-side, divided by a simple wire fence, while Royal Cinque Ports is about half-a-mile down the road. The road between them, devilishly named “Golf Road”, is about as wide as a twin bed, and if you should happen to meet an oncoming car, one of you must find a small strip of lay-by to let the other past. It’s all very polite and civilized, except for the one clown in the BMW who assumed the road was his personal possession and whipped past me at about 50mph… most unsporting, there, Fritz. I was invited to stay for two nights, and 36 holes, at Prince’s Lodge, the former clubhouse for the Prince’s course, but now a small and quite charming inn. My room was adorned with a blow-up poster describing Gene Sarazen’s victory in the only Open Championship to ever be played at Prince’s, in 1932. Belated congrats, Squire! 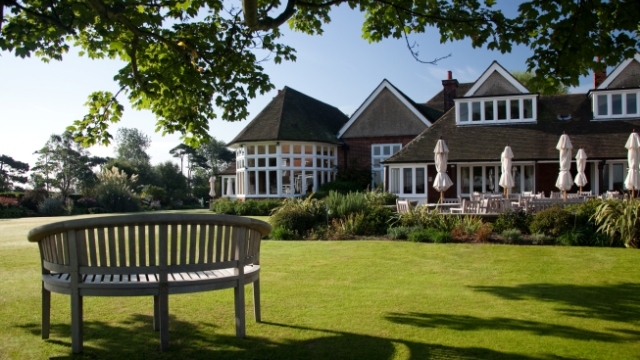 The Lodge sits at the southern end of the Prince’s course, overlooking the 5th green and the sea. Sitting on the bar patio with the sun slowly waning westward at 10pm and not a hint of a breeze, sipping a languid claret after a fine meal, and conjuring shots for the next morning’s outing… well, it just seemed to me to be about as pleasant a situation as I’ve ever quietly enjoyed. It would’ve been nice if Mrs. Deeks had been there, but frankly, the solitude and the atmosphere of the surroundings that just effortlessly brought P.G. Wodehouse to mind, were thankfully mine and mine alone. The modern-day Prince’s course consists of three nines. I played the original two, Himalayas and Shore. Because I was on my own, with just my thoughts and a course map, my mind drifted into idle rambling, and I imagined myself being the Squire himself, playing in plus-four’s and smoothing my way round the dunes and the galleries with a final round 74, beating fellow American Macdonald Smith by five shots. I didn’t play from the same tees, and I didn’t come close to the 74, but it’s always fun thinking you’re walking the same hallowed ground some 86 years later. Not that the course hasn’t been changed and rerouted somewhat. Doesn’t matter, really… what they’ve done is keep it up to modern standards. In fact, it’s understood that when it opened in 1906, Prince’s was the first course designed to accommodate the new, and much longer, Haskell golf ball, which replaced the old guttie ball, made of dried tree sap, in common use for over 50 years at that point. All three nines at Prince’s today measure more than 3,500 yards from the tips and would make a fine venue for the Open again… if it weren’t for the fact that Royal St. George’s is the preferred layout, and it’s right next door. But if Prince’s was the only course you were able to play down here, then you’d still feel you’d had a jolly good outing. Even in 35ºC and fairways baked as hard as a burnt biscuit. After my morning round at Prince’s, it was off to Royal St. George’s (RSG). Thank goodness my Kent Golf contact, a charming and efficient London PR executive by the name of Helen Heady, told me to take a caddy. If I hadn’t, I’d still be wandering the property looking for the green ahead, and the tee after that. And I recommend Simon Petts to caddy for anyone at RSG… he guided me impeccably and managed to look the other way when I decided to try a few do-overs. If his eyes rolled at any point, I didn’t notice. 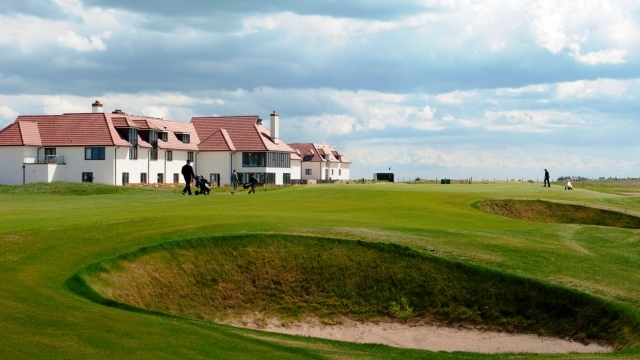 Royal St. George’s is the only southeastern layout in the 10-course rota of venues for the Open Championship. This is somewhat of a pity, because there are so many courses – the two neighbours here alone, not to mention links and non-links courses in southern England that would be fair and memorable tests for golfer and viewer alike. Nonetheless, RSG clearly deserves its honoured place in the rota list. It’s just a cut above the other two as a golf course and has ample property for all the infrastructure a major tournament needs today… parking, TV compound, merchandising, and so on. It is also clearly more refined as a private members’ club than the other two, for whom non-member play seems to be more of a tolerance, not a joy. That understood, a visitor will love the charm and history inside the clubhouse, a fine ale in the garden, and just the walk itself, regardless of score, around the golf course. For example, the now-famous bunker to the right of the 16th green, where Thomas Bjorn of Denmark took three whacks for a double bogey and saw his two-stroke lead evaporate on the final day of the 2003 Championship. Or the 14th hole where Dustin Johnson blew his ball OB into a cornfield off the tee, leaving the Claret Jug to be picked up by Darren Clarke in 2011. Heck, I even remember Bill Rogers winning here over a young rockstar lookalike named Bernhard Langer in 1981. It’s extra gratifying when you yourself tee it up, miss the bunker, keep the drive in play, make the 10-footer, and think, I could play with those guys! 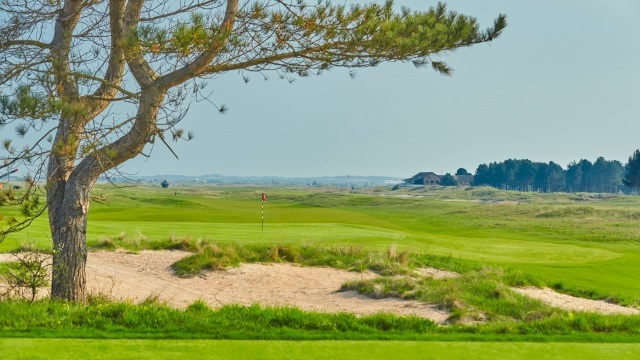 RSG distinguishes itself with many great holes, framed around and over mid-size dunes that make for very pleasing photos, as well as impediments to your score. As the ninth out of ten Open rota courses I’ve played, I’d personally put it sixth on my personal ranking, after Royal Birkdale, Turnberry, the Old Course, Carnoustie and Muirfield. I look forward to seeing how the lads do at RSG in the 2020 Open. RCP is, like Prince’s, just a snick less refined than RSG, but perhaps the warm welcome I received from Club Professional Andrew Reynolds biased my view from the moment I arrived. What a nice chap, who’s been welcoming people like me at RCP since he became Pro here 40 years ago! But I simply liked the golf course best of all. There are more peaks and valleys here, more mounds to play up, over and around, less flat greens, more variety of shots. All three courses, by the way, provided a fair number of blind or semi-blind shots. North Americans generally don’t like these, but I do – especially when the shot you planned is properly executed and is a delightful surprise when you discover it a few feet from the pin. I can see why the R&A has not deemed RCP quite up to scratch for an Open since it was last held here in 1920, but for the average golfer, it’s a great test and a fine walk. Speaking of walking, it was at Royal Cinque Ports in 1920 that Walter Hagen was told by the General Manager (pardon me, the “Secretary”) that the clubhouse was restricted to amateurs only. So, he very ostentatiously parked his hired Daimler out front, and changed his shoes with the car door open, in full view of the spectators. Point made, Walter, and well played! It was Walter Hagen who changed the prevailing attitude toward professionals from one of lesser-beings to fully-deserving equals, back in the 1920s. I was somewhat tempted to do my own Walter Hagen while in Kent, when I was politely informed at two of these courses that knee socks (or “full hose” in British parlance) were required… despite the 35º temperature, and the fact that my legs are quite attractive without cover, in my completely objective view. But, mid-20th Century dress standards notwithstanding, I highly, highly recommend a visit to this lower right corner of England to any golfer who’s got a visit to London on the schedule and some extra time for R&R… and especially to golf buddy groups who may have done Scotland north and south, Ireland north and south, and even England northwest. In fact, don’t make this number four on your list of priorities. The lovely Kent countryside, the proximity to London and the Chunnel to Europe, the many sights worth seeing, make this area a must-do, in my view. 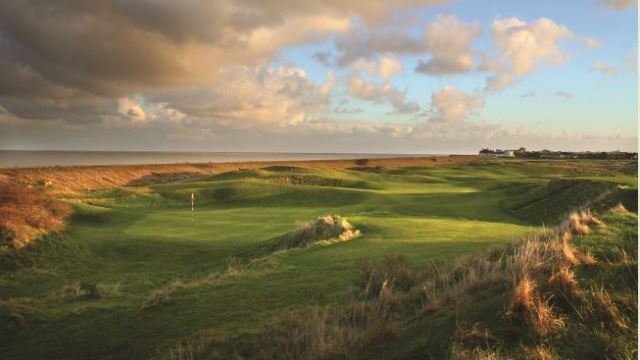 Combine these three Kent links courses with a couple of others like Littlestone, add in a few London-area heathland clubs like Sunningdale, Wentworth, the Berkshire and Walton Heath, and you have the makings of a golf cocktail that’ll knock your, um, knee socks off!